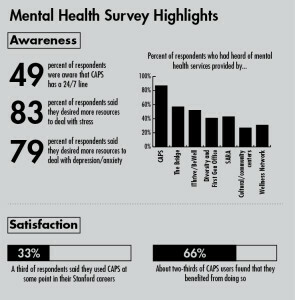 The ASSU Mental Health team has released their survey results about mental health and CAPS (VICTOR XU/The Stanford Daily). The ASSU Mental Health team has completed a wide-ranging survey that measures students’ perceptions of and experiences with campus mental health services. Emergent threads from the responses include a lack of familiarity with the constellation of services available for students and a demonstrated interest in the quality and type of care provided. According to the Mental Health team co-directors Nikita Desai ’15 and Anne Evered ’15, the survey played an integral role in opening up an ongoing, productive dialogue between University administrators and the ASSU on the topic of mental health. Evered traced the impetus of the survey back to spring of 2014 — after conversing with CAPS Director Ron Albucher and Vaden Health Care Director Ira Friedman, the team realized that they needed hard data to support the anecdotal murmurings they had heard about mental health on campus. Distributed via email and open from November 2014 to February 2015, the survey amassed 1,687 voluntary respondents. Fifty-four percent of respondents were graduate students while the remaining 46 percent were undergraduates, roughly representative of the University’s distribution of students. Making up 62 percent of the respondents, significantly more females than males participated in the survey. Hill commented that over-representation of women in voluntary surveys is somewhat typical. Many respondents expressed a lack of awareness about the mental health and well-being services available on campus, confirming a trend that the Mental Health team had picked up on from conversations with other students. The extent to which students were unfamiliar with the resources on campus, however, did surprise the team. Nineteen percent of those surveyed indicated that they were “not at all knowledgeable” about “Stanford’s approach to mental health and wellness,” while a quarter said that, if they suspected a friend or roommate was suffering from a mental health issue, they would not or probably not know how to act or where to seek help. Across all services, graduate students were significantly less aware of resources than undergraduates were. 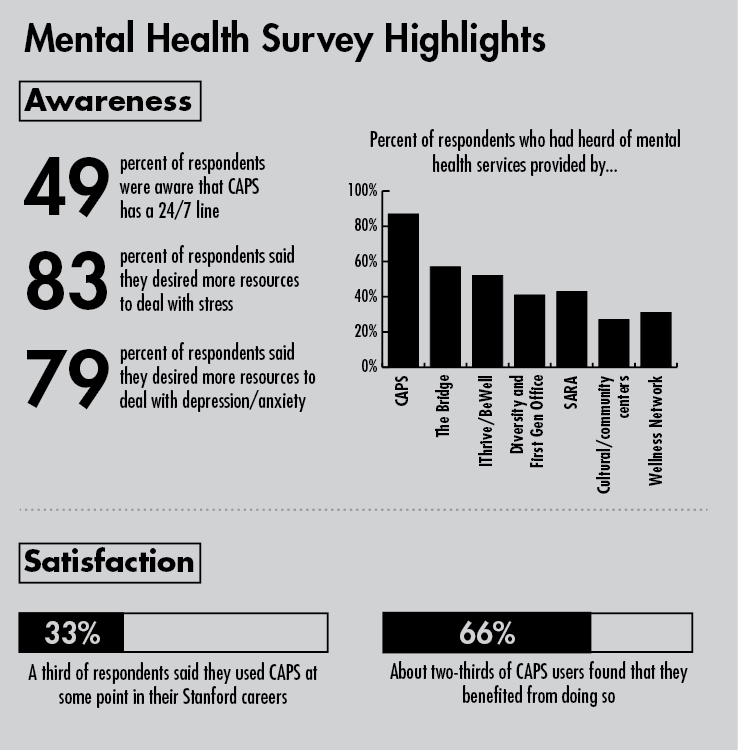 Only 49 percent of respondents were aware that Counseling and Psychological Services (CAPS) offers a 24/7 on-call service for urgent and emergent cases, and 13 percent had never heard of CAPS at all. In order to help students better navigate mental health and wellbeing services, Desai and Evered are developing a flowchart that visualizes avenues for care. The survey dedicated a third of its questions to soliciting students’ experiences with and opinions about CAPS. Approximately one-third of those surveyed had used CAPS at some point in their Stanford careers; for context, about 15 percent of the student population was served by CAPS in the 2014-15 academic year. These patient respondents reported generally positive opinions about their counselors, though a quarter of them were unsatisfied with their experiences with CAPS as a whole. Graduate students were significantly more approving of their experiences with CAPS than undergraduates. No statistically significant dependencies between experiences with CAPS and race, gender or prior exposure to psychiatric care were found. A large majority of patients wished for a mechanism through which they could provide feedback to CAPS — a sign that, when coupled with the high response rate, convinced the Mental Health team that students want a voice in their mental health system. Indeed, Evered was pleasantly surprised by the time and care that students seemed to put into the survey. “We had an outpouring of free-response answers to the survey with very detailed accounts of what should be improved in CAPS and clear concerns,” Evered said. Although the triage process was the subject of much discussion in February’s town hall on CAPS, 70 percent of students who used CAPS found triages (initial assessments and categorizations of the urgency of mental health problems) to be helpful and comfortable. Forty-one percent of respondents said that they would be unlikely or somewhat unlikely to visit CAPS, should they need help in the future. Large numbers of students cited doubts about the severity of particular health issues, mental health stigmas, uncertainty about the intake process and health insurance costs as deterrents to visiting CAPS. Albucher has previously stated that CAPS was underfunded and understaffed, and that the organization was hampered from an unusual amount of turnover during this academic year. CAPS has received additional funding and hopes to hire five new counselors by Sept. 1, 2015. Experiences with other counseling services on campus, though limited, were overwhelmingly positive. According to Desai and Evered, the contribution of the survey was two-fold: Not only did it provide them with a more audible pulse on student relationships with mental health and wellbeing services, it also helped cement a working relationship between the Mental Health team and University administration. Toward the end of winter quarter, Hill and members of the ASSU Executive Cabinet, including Desai and Evered, presented a preliminary report on the survey, compiled from the responses of about 900 respondents, to Albucher and Friedman. Both Desai and Evered described the survey and that presentation as pivotal in their relationship with CAPS and Vaden. Collaboration between these entities led to the creation of a number of joint initiatives, including PHE-led tours of CAPS, beginning fall quarter of 2016, and in-residence CAPS counseling, to pilot later this quarter in select residences. With elections on the horizon, Desai and Evered plan to speak extensively with the elected ASSU slate and hope to help them maintain the relationships they forged. Contact Akshay Agrawal at akshayka ‘at’ stanford.edu.